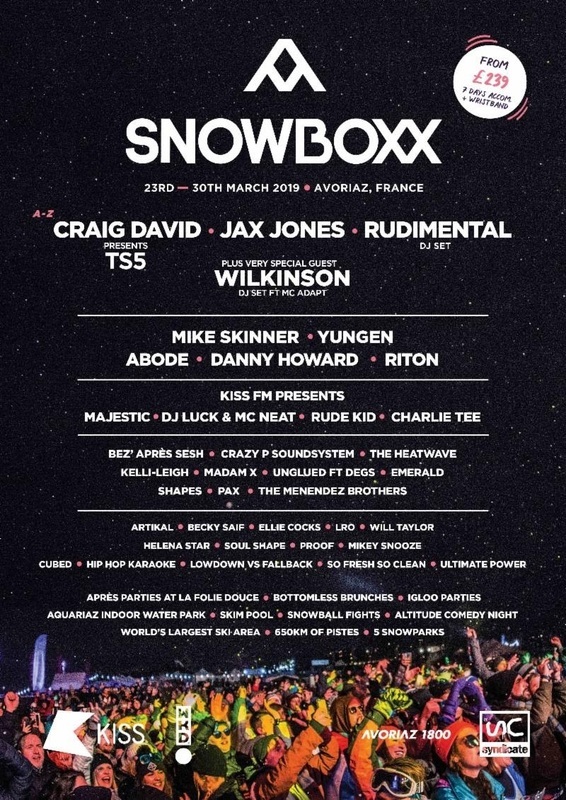 Mike Skinner, Bez’ Apres Sesh, Majestic, The Heatwave, Rude Kid, PAX, Madam X, Artikal and Becky Saif are among the acts who complete the Snowboxx 2019 line-up. Taking place in Avoriaz in the French Alps from Saturday, March 23rd to Saturday, March 30th, new for next year is the Tree House - an exclusive party with Mike Skinner in a wooden snow park in the Proclou forest - plus Abode and Wilkinson hosting parties at an Igloo stage that can only be accessed on a snowcat. The Snowboxx infamous Après sessions will be held at La Folie Douce’s new venue in Avoriaz this year. The snow and music festival previously revealed Craig David Presents TS5, Jax Jones, Rudimetnal (DJ set), Danny Howard, Riton, Crazy P Soundsystem, DJ Luck & MC Neat, Hip Hop Karaoke and Ultimate Power Ballads would feature. Seven-day packages for Snowboxx including festival passes and accommodation start at £239. For tickets and details go to snowboxx.com.